I actually have little butterflies in my stomach, little flutterings of nerves and excitement. I’d started writing and planning before our Kickstarter funded last week, but it didn’t feel real yet. It just got really real. Well, really, it got real last week when many of you blog readers and others helped us raise more than $4200 to tell our stories and the stories of several other amazing comics transformed through writing and performing stand-up comedy about mental illness, either of a family member or their own. After a brief message of thanks last week to Facebook and the backers who invested in our project, I’ve been quiet. I’ve felt like I “should” have been blogging about my excitement, and thanking everyone who invested, who shared or e-mailed our link, everyone who said a prayer or shared a word of encouragement. But I couldn’t, I was uncharacteristically quiet and……sort of heavy. Took me until today to figure out the heavy, and to piece together my thoughts. This afternoon, as I sit in an Oregon coffee shop preparing to write (drinking tea because I am such a rebel), I’ve figured it out. I needed that time to accept the weight, the significance of the gift given to me and to my co-author, Dave Mowry. The gift of faith in our intentions, in our abilities, and in our passion to share our stories. (Don’t worry, I know a few of you supported us just because you love us. I’m good with that too.) Whatever the motivation of those who made it happen, I’m overwhelmed with gratitude and a compelling sense of responsibility to do this well. Today feels like the official first day of being An Author, A Writer. Better yet, An Author about Being A Stand-Up Comic. So far I know I am going to need to leave the house to write, at least for now. My extreme lack of interest in the finer points of housecleaning is in direct conflict with my fondness for an peaceful, uncluttered environment, so until I get a handle on that I will be sampling various coffee shops that sell tea and quiet library corners. If you don’t mind, when I’m not musing about the one rock we ground up and eat; or ridiculous ways I’ve hurt myself, I’m going to blog this bookwriting journey. I hope you’ll stick around. I Wonder What Molybdenum Tastes Like? Really, have you thought about it? I mean, it’s a mineral we grind up and put on our food. We don’t grind up other rocks to put on our food. Don’t get me wrong, I love me some salt. Without salt, many foods are pointless: popcorn, hash-browns (this evening’s muse), french fries, eggs. No salt, no point. But what inspired early man – or let’s face it, woman, since she was likely responsible for the culinary innovations of the time like cooking with fire, not eating potatoes raw, and always garnishing your kill with a sprig of mint – what inspired her to grind up salt crystals and shake them on dinner? So, I’m wondering, what does molybdenum taste like? 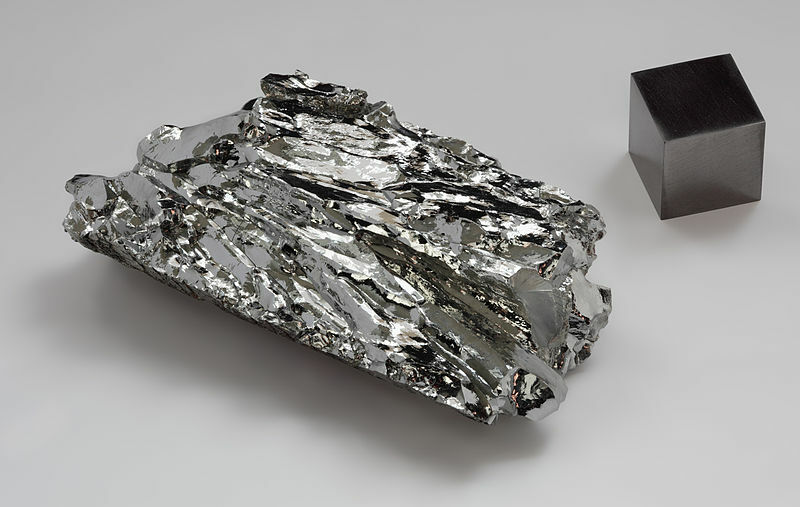 Molybdenum – pretty, but does it taste good? See? Boring, and not a word about molybdenum’s potential ability to improve hash-browns. Or mushrooms! Now THAT would be a significant role! A rock that could make fungus not taste like dirt would be worth a lot of money! Wikipedia makes clear, however, that molybdenum has the sixth-highest melting point of any mineral, so its nacho-topping utility is probably limited at best. Actually, the magical oracle which is Wikipedia can’t even seem to agree how many minerals there ARE (at least after an exhaustive 3.25 minutes of searching), and seems conflicted as to whether it is molybdenum or molybdenite. With such uncertainty existing in the field, I think there is clearly work to do. We must determine if any minerals taste like salted dark chocolate or a really good margarita. Posted in humor, Rants, Uncategorized and tagged comedy, humor, Random, salt crystals. Bookmark the permalink.